Please note that the instructions below only work with the original retail version of PowerDVD 8 Ultra (version 8.0.1531). There has since been several updates to PowerDVD, and testing shows that the HD DVD patch no longer works (the player exits just as playback is about to start). The latest version of PowerDVD has been released. It brings a lot of new features, such as a movie collection manager and online interactivity. It also includes Blu-ray playback that will eventually support Profile 2.0 (BD-Live). Unfortunately for HD DVD users (as if the first few months of 2008 hasn't been disappointing enough), PowerDVD 8 Ultra removed HD DVD playback even though it was in PowerDVD 7 Ultra. Luckily, Cyberlink made sure that both PowerDVD 7 and 8 versions can be installed at the same time, so users with PowerDVD 7 Ultra can still use it for HD DVD playback. That could be the end of the story right there, except chatter on forums indicated that a beta version of PowerDVD 8 did include HD DVD playback at one stage, and some experimentation later, it turns out the retail version of PowerDVD 8 Ultra can have HD DVD playback re-enabled. And this guide will show you how! Please note that you will need PowerDVD 8 Ultra - any other versions including the Deluxe version that doesn't already support Blu-ray playback won't work. The instructions are pretty easy, especially if you're familiar with registering filters, but I will go through it all here for those that don't know how. The instructions are for Windows XP, although they can be easily applied to Windows Vista. 64-bit Windows users will require separate instructions, and while they will be provided here, I cannot confirm that it works (since I don't have 64-bit Windows to test it out). OK, the hardest part is to obtain the files you need. I've seen these files floating around forums and newsgroups, but the most easily downloadable place I've seen is here. Just go there and download the "powerdvd8ultra_hd-dvd.rar" file. There are instructions in the file, but I will expand them out in this guide. Once you have downloaded the files, open it with WinRAR or any other compression software that supports RAR files. Now locate where your copy of PowerDVD 8 Ultra has been installed. 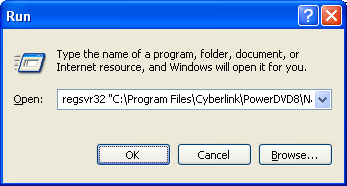 By default, on Windows XP, it should be in "C:\Program Files\CyberLink\PowerDVD8". Now extract the contents of "powerdvd8ultra_hd-dvd.rar" into where PowerDVD 8 is installed (note on 64-bit systems, it could be installed under the "C:\Program Files (x86)\" directory - see subsection at the bottom of the guide). Several new files should now have been added to your PowerDVD folder - check to make sure they're in there. 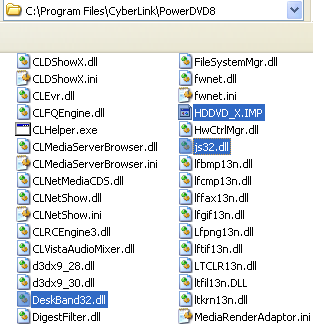 Make sure the quotes are in there, and replace "C:\Program Files\Cyberlink\PowerDVD8\" with something else if you installed PowerDVD 8 in another folder. Press the OK button to run the command, and if successful, you should get a prompt window telling you so. If you get an error message, especially the "0x80070005" error under Vista, then this means that you may need Administator permissions to run RegSvr32. To do this under Vista is easy, click on the Start menu button and then search for the program "Command Prompt". When it shows up in the list of programs, right click on it and select "Run As Administator". Now type in the regsvr32 command above (again, make sure you subsitute "C:\Program Files\Cyberlink\PowerDVD8\" with the actual path of your PowerDVD install) and you should hopefully now get the success prompt telling you that HDDVDNav.ax has been registered successfully. And that's pretty much it. Insert a HD DVD disc and PowerDVD 8 Ultra will now play it. Note that I did have some problems playing certain HD DVD titles (PowerDVD switches to "File Mode" upon trying to play the Happy Feet), while other titles (like Top Gun) played perfectly. For discs that don't work, it is highly recommended that you try PowerDVD 7 Ultra. If you have the 64-bit version of Windows Vista, then the instructions are slightly different. What you need to do is to extract all the files in the "NavFilter" folder (in the powerdvd8ultra_hd-dvd.rar file) to "C:\Program Files (x86)\CyberLink\PowerDVD8\NavFilter\". 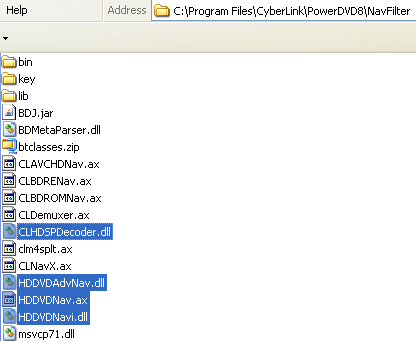 Then, you need to extract the other files (deskband32.dll, hddvd_x.imp, and js32.dll) to "C:\Program Files (x86)\CyberLink\PowerDVD8\". Finally, run regsvr32 as above on "C:\Program Files (x86)\CyberLink\PowerDVD8\NavFilter\HDDVDNav.ax". This should do it. If you get a "0x80070005" error, then see above to find out how to run regsvr32 as Administator.